Late last year, Gotham West Market opened on super super west side of Manhattan (oh dude what a walk from the A/C train). It’s basically a big food court like space with food “stalls” from The Cannibal, Little Chef (from Caroline Fidanza owner of Saltie), Court Street Grocers, etc and The Brooklyn Kitchen for your kitchen supply needs. Though one of the more anticipated opening was Ivan Ramen Slurp Shop. From what I have read online, Ivan Orkin is suppose to be a genius at ramen making and for him to be popular in Japan that’s a pretty huge deal. There was so much hype for this place. Check out what Howard and I thought about the ramen. Howard: I went to the Gotham West Market because I wanted to try the Little Chef. I’m a huge fan of Saltie, and so I wanted to help support this new venture. But when I got to the Market, even though it was only 5:30 in the evening, the people at the Little Chef told me they were no longer serving food. So I headed over to Ivan Ramen Slurp Shop. I ordered a bowl of the vegetarian shoyu ramen ($13), with an egg (an extra $2) because I know from experience that an egg adds a lot of good richness to any ramen. The good: The noodles. Oh my goodness the noodles. At Ivan Ramen Slurp Shop they serve rye noodles, and maybe that has something to do with the incredible texture. Although the noodles are incredibly thin and delicate looking, they are in reality very firm and chewy and I couldn’t slurp them up fast enough. The bad: the broth. As good as the noodles were the broth was equally bad. It had a kind of funky sharpness to it; maybe it had been simmering and reduced too much, I don’t know. But I do know that I left all of the broth in the bottom of the bowl. Donny: I was actually excited about Ivan Orkin opening a ramen joint in NYC, especially after seeing him in an episode of David Chang’s Mind of a Chef season. And obviously, I have heard many good things about his ramen and just the enthusiasm from fellow food people. I went on a random weekday for an early lunch. 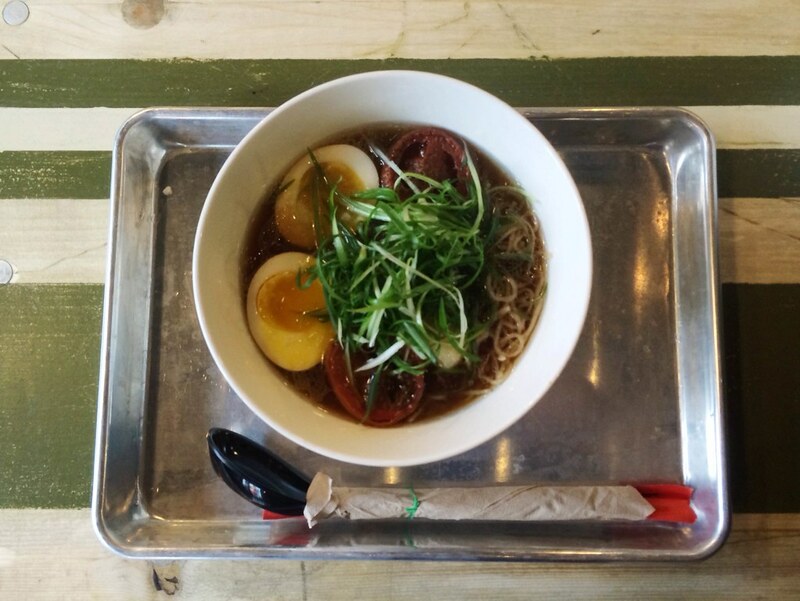 The whole Gotham West Market was still quite empty but there was already a short line forming at Ivan Ramen. I got the classic shoyu ($13) with an egg ($2) and a roasted tomato ($2). Let’s start with the good stuff. Like Howard, I really enjoyed the rye noodles. Great snap to them and tasted very much like wonton noodles. I had no complaints about the slices (2) of pork belly, pretty standard stuff. While Howard hated his vegetarian broth, I found the shoyu broth pretty good but nothing special. As for the bad stuff…what do you mean I have to pay $2 for an egg?! Look, for me a proper bowl of ramen, you gotta have pork, bamboo shoots and an egg. What’s this BS about having the egg separate? Boo! Anyways, $13 is a bit expensive for the amount of food I got and the overall quality was just good, not great.